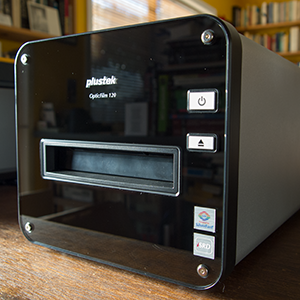 We unpacked a Plustek OpticFilm 120 early this morning at the bunker. It's not a small scanner yet we're tempted to call it compact. And we don't need any temptation to call it attractive. It's a handsome unit. Although we do confess to some confusion about the rear cover. It's intended to prevent dust from entering the scanner from the rear film holder slot but it also covers the USB port and power connection. So to close it, you have to remove both cables first. Front View. An attractive unit. Mouseover to see rear cover. We won't have a full review finished until the Ides of March at the earliest. You can skip to other stories in the review as they become available using the new story menu at the top right. But in the meantime, there are a few things we can already point out. The specifications for the OpticFilm 120, which can handle 35mm and 120/220mm film, are impressive. Net Weight: Approx. 12.57 lbs. Worth highlighting among those is that SilverFast bar-coded calibration targets are supplied (making it painless to profile the scanner) and there is indeed infrared scanning for automatic defect removal. SilverFast Ai Studio 8 is bundled with the scanner, by the way. During the scanner's development, LaserSoft Imaging "significantly contributed to achieve the OpticFilm's superior quality," Plustek said. SilverFast's multi-exposure feature is how you get a dynamic range of 4.01. And applause for Plustek for citing a number and how it was achieved. It should inspire others, let's just say. Not mentioned but featured nonetheless is motorized film transport so you don't have to manually advanced the holders. And those holders include patent-pending, adjustable pitch 120 film holders to hold the film flat. 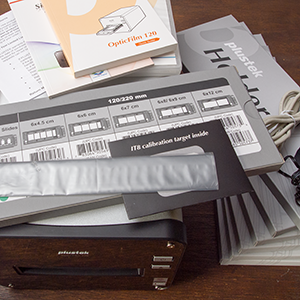 You don't have to cut 3-frame 6x7 120 film strips either. And the two-strip 35mm holder is a welcome sight, too. Seven film holders for 35mm film strips (12 frames), 35mm mounted slides (5 slides) and 120/220 film sizes of 6x4.5cm (4 frames), 6x6cm (3 frames), 6x7cm (2 frames), 6x8/6x9cm (2 frames) and 6x12cm (1 frame). We'll have more to say about the OpticFilm 120 shortly, so stay tuned. And use the Feedback button to forward any questions you'd like us to address. 1. I am one of many people using 6x17 format (as well as 6x6 & 6x8). If this is a good scanner, it might be worth me scanning that 6x17 in two sections and stitching -- but it is not clear whether the film holders will let this happen. 2. I know that they say 5300 dpi, but other brands talk about large numbers and are not able to resolve anything more than about 2000 dpi. If I am to go with this, then I will want it to resolve at least the 3200 that the imacon can do. So what is the practical resolution?